Manufacturing in Texas continues to have a strong year. Manufacturing continues to contribute to job and wage growth in Texas as factory activity increased again in July. Texas manufacturing employment grew 6.0 percent annualized quarter-over-quarter, which is much higher than the national rate of 0.5 percent. Eighty percent of the manufacturing jobs created in Texas this year have come from the durable goods industries. According to the Dallas Fed’s Texas Manufacturing Outlook Survey, the production index, which is a key measure of manufacturing conditions, rose to 22.8 in July, up 11 points from June. The survey also confirmed stronger employment growth and longer workweeks. Business executives responded that their expectations regarding future conditions remain optimistic. Wages continued to rise in July with Texas manufacturing jobs paying nearly a ten percent premium in hourly earnings compared to the national average. Throughout the state, however, wages fluctuated widely. Fort Worth had the highest manufacturing wages, paying 50.6 percent more than the statewide average while Houston manufacturing wages slid down 4.3 percent, despite adding over 11,000 jobs. 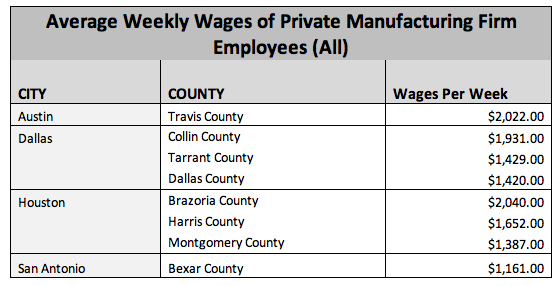 The most recent census by the Bureau of Labor Statistics shows the average weekly wages of private manufacturing firm employees by county. The average figures include not just production workers but also engineers and administrative positions. 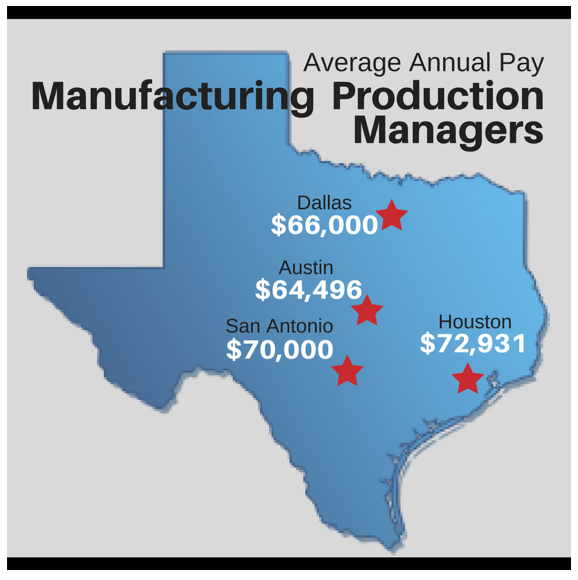 Further research and surveys conducted by Payscale.com show the range of pay for manufacturing production managers throughout Texas. Like other industries, manufacturing is increasingly becoming a knowledge-based profession. The primary work objectives of the job are accomplished through critical thinking rather than through physical labor. The skills that manufacturers need are those skills that work in tandem with the technology applications present in manufacturing today.